There are fewer places, it seems, with as fascinating and dynamic landscapes as Iceland. I’ve lived on this chilly island for a few months now, and picked up a few tips along the way–number one: never travel anywhere without your swimsuit! I recommend renting a car straight from the airport and embarking on a roadtrip, which, in a country with only 8 people per square mile, is really the only way to see Iceland. The Ring Road will take you across the unforgettable scenery of the island, from dramatic snow-capped mountains in the south to bubbling lava pits in the north to glacier fingers in the West Fjords. It’s best to estimate about 8 days to circle Iceland at leisure, more if you intend to check out the West Fjords. When you go definitely matters! Summertime is bright and green, and in autumn the grasses change to russet. I drove around Iceland in October, and a lot of the northern highlands and eastern fjords was covered in snow! Winter is definitely rainy and blizzard season. Be sure also to book your accommodation in advance–the infrastructure is still limited in Iceland, especially out of the cities, and many places can fill up! I learned this the hard way, and had to spend a bit on the phone calling around for a place to stay. So what are my top places to see in Iceland? 1. Reykjavik. Capital of the quirky and colorful, Reykjavik is packed with minimalist designer boutiques, cafes, and bookshops. You’ll need at least 2 full days to see all of the highlights. I headed down the main street of Laugavegur, where people can shop for souvenirs and grab a bite to eat. Further down the road are the best bars and the harbor, with its plethora of seafood restaurants. If you see one museum while you’re here, try the National Museum–I easily spent a few hours there. The museum contains artifacts from the medieval times all the way to the modern era. Take a morning stroll on Saebraut–the seaside path–or grab breakfast at the Sandholt Bakery. 2. Thingvellir. The first stop on the itinerary is Thingvellir, a beautiful valley not far from Reykjavik, dramatically poised between the North American and European tectonic plates. Once the site of the medieval Icelandic parliament, it’s now a UNESCO World Heritage Site. I highly recommend going with a guide to snorkel or scuba dive at the nearby Silfra stream, in some of the cleanest water in the world. The best part is that you don’t really need any gear–the tour guides provide you with a drysuit, mask, gloves, snorkel gear, scuba tank, and flippers. They even take professional photos of you and the crystal-clear turquoise water, so you can just relax and enjoy the ride. 3. Snaefellsnes. Next stop on your itinerary should be Snaefellsnes, a large peninsula in West Iceland, home to Snaefellsjokull, which earned a glimmer of fame in Jules Verne’s Journey of the Center of the Earth. It takes about 6 hours to drive from Reykjavik all around the peninsula. You can wander around the dried lava fields or visit the saga sites in Borgarnes or Reykholt. I stayed in a cozy farmhouse just outside of Borgarnes–a lot of farming families rent out their spare rooms or cabins to travelers. No equipment necessary–all amenities included–but be sure to pack dinner and breakfast, as most have lovely kitchens for you to cook your own meals. 4. Myvatn. Myvatn is fun just because of the diversity of things to see. 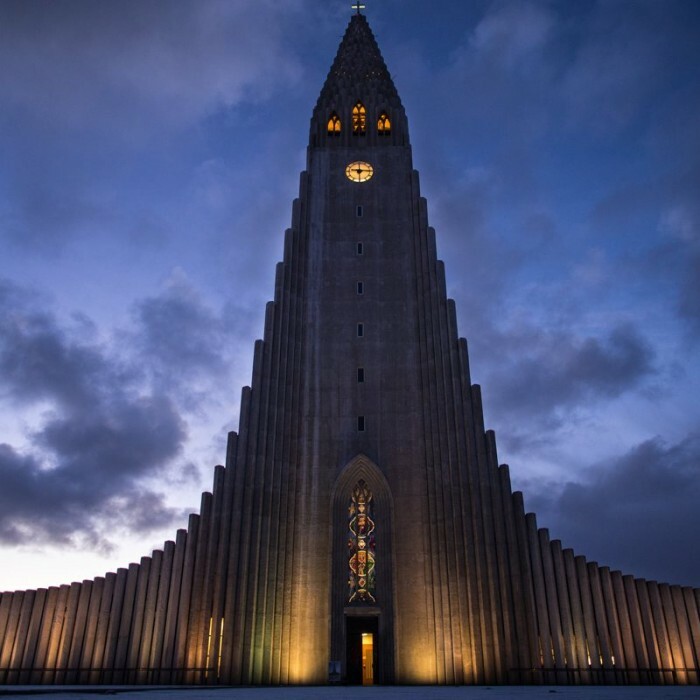 You can easily spend a day or two visiting the black rock columns in Dimmuborgir, admiring the blueness of the lake, or driving out to the powerful Dettifoss waterfall and Krafla lava fields nearby. 5. Jokulsarlon. The glacier lagoon in southeast Iceland is breathtaking. I couldn’t believe how many shades of blue and white and gray there were! There is something truly mesmerizing about gigantic blocks of ice stirring slowly in water. If you’re lucky you can spot seals swimming in the lagoon. 6. Skaftafell. Skaftafell National Park is a haven for hikers, with waterfalls, glaciers, ponds, and rivers galore. If you plan to walk on a glacier or into an ice cave, reserve with a guide well in advance. The area can be dangerous for tourists who don’t know it, and tours often book up. Other gear, such as crampons and extra water, are usually provided. And be sure to allot a lot of time–usually a day or two–to enjoy the park’s scenery. 7. West Fjords. The West Fjords are a challenge, with its long, winding roads and, except for the single city of Isafjordur, a mere smattering of villages. If you like rugged terrain and have some extra time on your schedule, though, give it a shot. I spent one memorable day hiking out in the Hornstrandir Nature Reserve, the northernmost tip of Iceland. With no permanent human population and its ghostly fjords, you can truly feel like you’re at the edge of the Earth. 8. Hveragerdi. The perfect way to unwind after a perfect journey. Just a 45-minute drive from Reykjavik, Hveragerdi is home to a hot stream that runs from the mountains into a small peaceful valley. It was absolutely unforgettable –I hiked up a few kilometers into the dirt hills and down into the green, mist-filled vale. I definitely recommend staying a minimum of 2 hours soaking in the water. You can even bring a few eggs — some of the smaller pools are hot enough for boiling! 1. Map and GPS navigator (one, two, tree). You can’t really get lost on a roadtrip around Iceland–there is only one main highway, the Ring Road, but it sometimes pays to have a map. Maps can be useful if you want to judge the distance until the next town or the next gas station. Stay on the roads listed on your map–you can incur a hefty fine if you drive off-road. Maps also identify which roads are paved and which ones are actually unpaved, rocky highlands. Only attempt a highland road if you’re driving a 4-wheeler–these roads are notorious for their rugged terrain. Anything less than a 4-wheel car may get you stuck in the boonies far from any trace of civilization! 2. Food. You can pick up quick food like snacks, pasta, and soup at any number of gas stations on the road. Dried fish or fruit make great nibbles in the car, and most hotels, while they may serve breakfast, also offer a kitchen to cook in. Cooking your own meals will significantly cut down on costs. Various protein and energy bars will also be useful. 3. Camera, tripod and monopod. Iceland’s landscape is gorgeous, dramatic and picturesque–so be sure to have your camera ready. A DSLR is best to catch some of the more subtle delights, such as the Northern Lights. And a tripod is handy when shooting waterfalls or puffins. And of course a monopod is needed to make beautiful selfies! Also a pair of good binoculars would be good to watch birds. 4. Sleeping bag (light, warm) and sleeping pad. Hotels and hostels on the road provide linen and blankets, but be aware that some charge you extra of around 1000 kronur ($8) per night. If you’d rather save on the pennies, be sure to bring a sleeping bag–or if you’re staying 10 days or more, rent one before you head out of Reykjavik. 5. Windproof (men, women) and fleece jackets (men, women). Definitely pack your windbreaker–the wind is often fierce in Iceland, especially on the west coast, and rain or snow is not uncommon! Make sure it’s also a jacket that can get dirty–often your adventures will take you horseback riding or spelunking, so be sure you can watch off the grease and the grime. 6. Waterproof trekking boots (men, women) and hiking socks (men, women). Hiking boots are great for the rugged of Iceland, and if you are doing any sort of off-road trekking through the lava fields of Myvatn or the gentle hills of Hveragerdi, you’ll need a good pair of shoes. Shoes which are warm yet breathable, with a lot of support for your ankles, are best. Though they may look a little out of place in the fashionable streets of Reykjavik, the boots will save your life and (more to the point) your feet! 7. Warm clothes. Iceland is cold year-round, and though it does tend to have sunny summer days, the weather is notoriously unpredictable. So make sure you pack thermal pants (men, women) and t-shirts (men, women), gloves, hiking pants (men, women), sweaters, a beanie and possibly a balaclava or scarf to protect the upper bit. Icelandic wool is always a good investment, and makes great souvenirs. Layers are your friend! 8. Sunglasses and sun block (face and body). Believe it or not, the sun does shine in Iceland, and especially in the summer. The sun hardly sets at all during midsummer. Sunglasses are always a good idea to protect your eyes–and if you’re doing any glacier-walking or snow-trekking, sun block is a must. 9. Torchlight, headlamp and extra batteries. Days are short in the winter, and some valleys in the West Fjords can go weeks without feeling the sun’s warmth. Be sure to bring your torchlight just in case, and you won’t ever have to worry about fumbling around in the dark. 10. Swimsuit and travel towel. Icelanders are all about swimming! Hot pools are a main event, and families often head to local warm springs or hot swimming pools to stir in the water and share the latest gossip. If you forget your swimsuit in the city, it won’t be a big deal–you can rent a spare at the pool’s front desk–but if you’re the wilderness, it’s good to have your own handy! 12. First aid kit and blister bands. Photos by Wailana Kalama, Bryan Pocius, Daniel Williams.